My first teachers in movement, improvisation & contact were Oleg Ignatiev (Yaroslavl, Russia), Oleg Sulimenko (Russia-Austria), Danny Lepkoff (USA) from 1988; contemporary dance and butoh with Paula Josa-Jones (USA). I studied transpersonal psychology (with Sergey Vsechsvyatsky and Vladimir Kozlov, Russia, 1989-1994), as well as different approaches in personal development (in the Institute of Personal Development, Moscow). I got my PhD in Psychology in 2008 through International Academy of Psychological Sciences. Also I studied Bodynamic Therapy with Lizbet Marcher and Eric Yarlsness (Dеnмарк, 2010-2011). Co-founder of Great Net Theater (Yaroslavl, 88-92) and Studio for Dance Improvisation (Yaroslavl, 94-97). 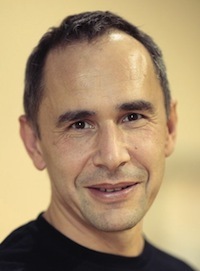 Artistic director of Performance-Trio (1997-2002), and Alexander Girshon Performance Project (Moscow, since 2002). I participated in numerous of local, national and international dance events, festivals and collaborations. One of the first teachers of contact improvisation in Russia. I was one of the original founders of the the International Festival of Movement and Dance on the Volga “Art of Movement” and was the artistc director of festival steering committees in 1996-2006. I was also the director of the Association of Contemporary Dance and Performance in Yaroslavl (1997-2000). I’m also a dance researcher and author of two books and many articles about improvisation and dance therapy. My work was mentioned in American Dance Magazine (2001) and American Journal of Dance Therapy (http://www.springerlink.com/content/l3122118w8332430/fulltext.html). I do my best to develop integrative approach in dance-movement therapy and still teach workshops and long-term programs in Russia, Ukraine, Belorussia, Israel, Kazakhstan, Latvia and Lithuania.